A Tentative Ranking of the Clannishness of the “Founding Fathers” – Short post where I fit the founding colonial settlers into HBD Chick’s clannishness system, going from the least clannish to the most. Here, we see a smooth progression in one of the key hallmarks of clannishness, emphasis on extended family. Maps of the American Nations – Here, I recount the story as told by Hackett Fischer and Woodard and add supporting evidence for the existence of the ethnocultural nations as delineated by the latter. In addition, I give background on and evidence for the genetic underpinnings of these distinctions, relying on the work of the venerable hbd* chick. I feature plenty of maps, showing how the American nations live on in our politics, our language, even our drugs. The primary message is that HBD works within nation states, and that a group, like White Americans, should NOT be thought of a monolithic collection at all, but a highly diverse and significantly varied collection of distinct peoples. Rural White Liberals – a Key to Understanding the Political Divide – Here I discuss various “alternate” theories to the various cultural divides across the continent, using the example of various pockets of rural liberal Whites scattered across Greater New England and the Midlands. I show that the rural-urban split cannot explain the divisions we see, nor can effective land prices (the “dirt gap” theory of Steve Sailer’s). I touch on religion and the spread of settlement following religious lines. I also talk about the effect of population density. Demography is Destiny, American Nations Edition – Follows up”More Maps”; reviews a paper showing that differences across the county level in the U.S. is ultimately driven by the ancestral makeup of those counties. Discusses the role of immigration and settlement patterns in shaping outcomes across the various regions of country. Proves the lack of existence of “assimilation” for immigrant groups; rather, the descendents of these immigrants shape the country today. Genes, Climate, and Even More Maps of the American Nations – In the preceding post, we’ve seen that demography is key to modern outcomes. But how did the demography get that way? Geography and climate were involved. 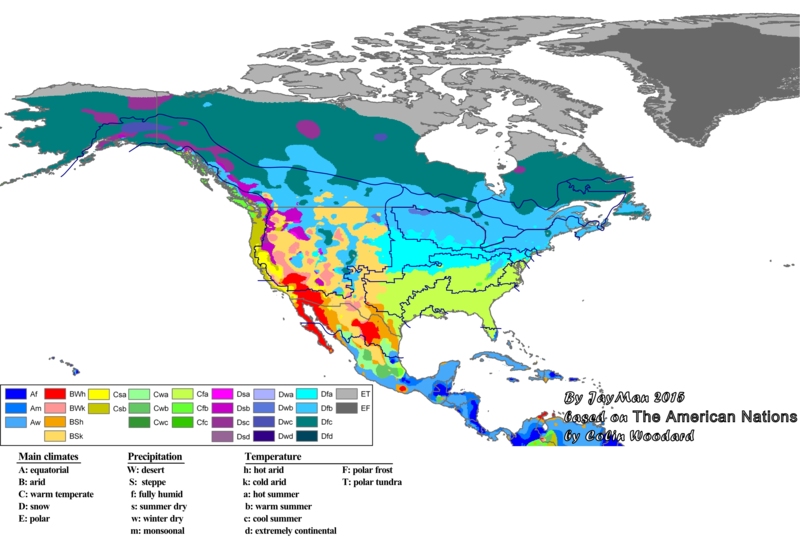 Shows how the modern American nations can be linked to geographic and climatic variation, explaining the maps seen below. The Donald Trump Phenomenon: Part 1: The American Nations – In short, the American nations in action. Shows how the genetic ancestry (ethnicity modified by self-sorting) can explain the 2016 presidential election. Shows the distinct regional and ethnic support for the different primary candidates. Particularly, shows how much about the battle between the primary contenders (and eventually the general election itself) is – like much about the divides between the American nations – a clannish-WEIRDO split. Predicts what regions will vote for whom. The Genetics of the American Nations – Final confirmation of the American Nations from the genetic data. 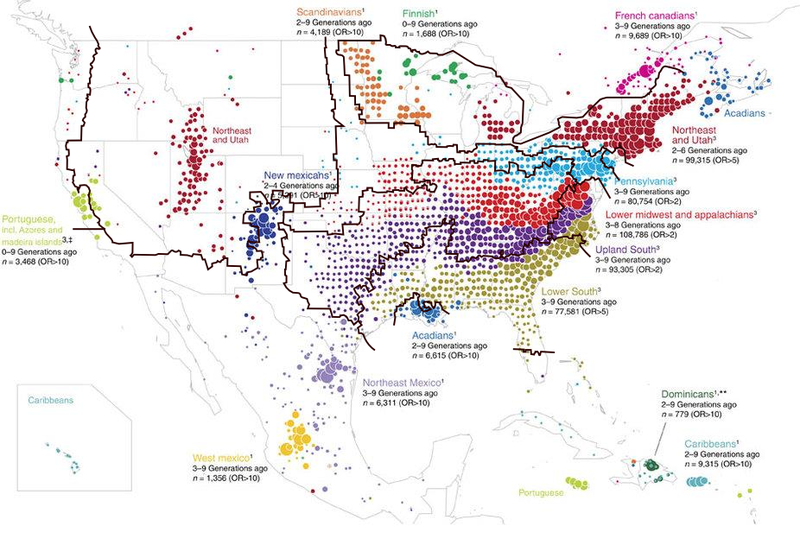 Reviewing genealogical and genomic data from Ancestry.com reveals distinct patterns of genetic clustering, that tightly corresponding to the American nations model. Compare the following (discussed in “Genes, Climate, and Even More Maps of the American Nations” above). 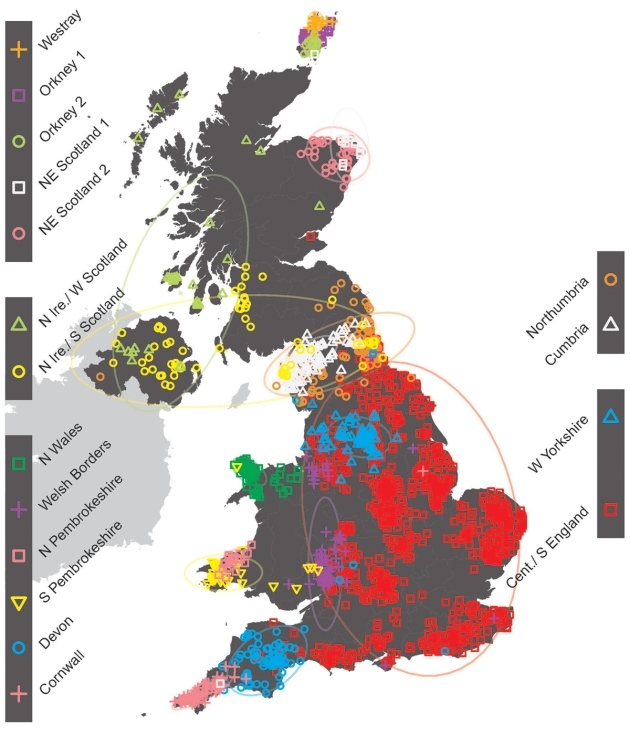 Left image from Leslie et al (2015), The fine-scale genetic structure of the British population. Nature 519, 309–314. Important Books to Understand Our America Today | Language For You!